In this section of the model, we define the objects and gather information using a standard consistent capture method, which includes documenting the workflow and lifecycle of documents and information. Although this is a time consuming step, gathering information is well worth it because you capture the information once and then use it many more times in the future. One of the goals of the Measure phase is to determine the location or source of information processing problems as precisely as possible by building a factual understanding of existing information process conditions. That knowledge will help narrow the range of potential causes requiring investigation in the Analyze phase. In the Analyze stage, we develop theories of root causes and confirm the theories with collected data. 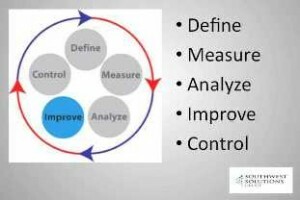 This step identifies that root cause of any issues uncovered in the measurement phase, and the verified cause will then form the basis for solutions in the Improve stage. In the Improve phase, we make changes in a process that will eliminate the defects, waste, and unnecessary costs that are linked to the need identified during the Define and Measure phases. The purpose of the Improve phase is to demonstrate, with fact and data, that our solutions do solve the problem identified in the Analyze phase. During the Improvement phase, the solution is piloted, and plans are made for full-scale implementation. Putting a solution in place can fix a problem for the moment; however, the activities in the Control step are designed to ensure that the problem does not reoccur and that the new processes can be further improved over time. 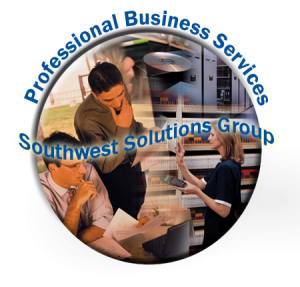 Southwest Solutions Group has been serving the records and information management industry since 1969, and we are long standing members in the information management industry through membership in ARMA, AIIM, AHIMA, and IAPP associations. Our experience with the basic principles of good document management with paper filing has positioned us to understand and design document imaging systems. 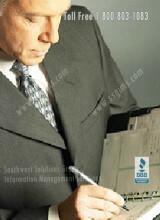 Contact us today at 1-800-803-1083 for a free consultation session or visit us on the web at www.ssgims.com so that we can help you navigate the maze of regulatory issues impacting your business.